Guide: bulk buy stylus pen prices. Prices are all in inclusive of Print, Set up and Delivery anywhere in UK and Western Europe. VAT extra. For quantities of 5,000 and 10,000 please ask Crazy Dave. 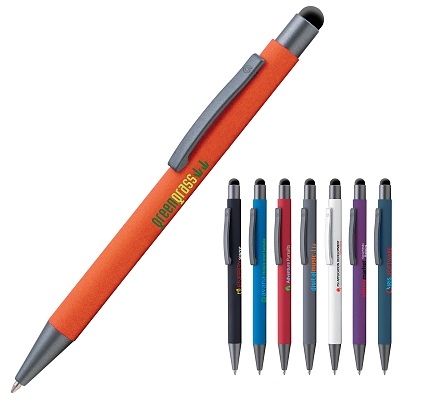 Retractable 2-in-1 stylus pen with soft-touch rubberised barrel and distinctive gunmetal trim. Laser engrave to reveal a striking silver mirror finish or digitally print full-colour. This printed stylus pen is fitted with a German ink refill for a noticeably smoother writing experience. Available in 8 popular colours with a choice of blue or black writing ink. We also supply Promotional Pens without stylus tips. Many of our stylus pens are available without stylus tips so please ask Crazy Dave for prices. Lead time: 13 working days. The Bowie pen is also available as a ballpoint pen without a stylus tip. Available in 15 fabulous barrel colours. Full colour printed stylus pens. Free Delivery include one UK mainland address. Lead-time 12 working days after visual confirmation.